There was great excitement at the archive on Saturday 17 March. Not only was it our first Sparky Saturday, we were also preparing to welcome a VIP (Very Important Pig). Visitors of all ages had booked their places for the Sweet Treats event. The Marks in Time exhibition soon filled up with people eagerly following the Sweetie Trail, and the Children's Area was brimming with little Percys as Percy masks were made. Then it was into the Activity Room to take part in some very serious sweetie tasting. Once the marshmallows, liquorice allsorts, flying saucers and Percy Pigs had been carefully studied and rated on appearance and taste, it was time for the main event. 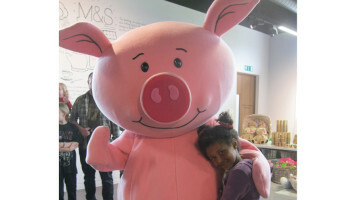 Percy Pig was thrilled to see so many people at the archive. He said hello to all our visitors, had his photo taken and even did a bit of dancing! We all had a lot of fun, for details of more Sparky Saturdays please have a look at our Events page.